Since the work of V. O. Key in the 1950s, historians and political scientists have often described American political history in terms of punctuated equilibrium. Long periods of stasis are interrupted by short bursts of dynamism. The stasis constructs “party systems” that endure a couple generations, then break apart in what the deadpan jargon of social science dubs “realignment.” The realignments are never as simple as pendulum swings from left to right or right to left, however. They are more like redefinitions of what right and left mean, and they come to be dated by elections that look in retrospect like paradigm shifts. And if the flaying of the Republican and Democratic establishments in 2016 was not a realignment it at least portended that one is in the works. 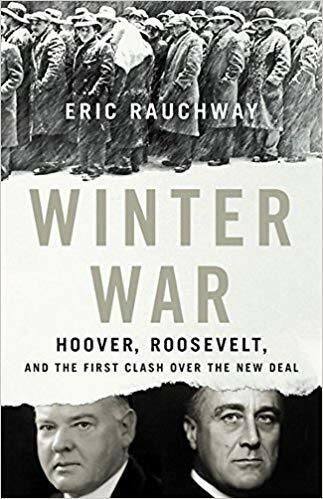 In Winter War: Hoover, Roosevelt, and the First Clash over the New Deal, Eric Rauchway takes a timely look at another epic realignment — one of the biggest of all — in 1932. In the chilly months between Franklin Roosevelt’s victory in November and inauguration the following March, he and outgoing President Herbert Hoover engaged in a battle of wits as the latter tried to pin the former into as many conservative policy corners as he could. It didn’t work. Roosevelt had an agenda; it wasn’t Hoover’s; and both of them knew the outgoing administration could do little to stop it. But Rauchway’s story is more than a titanic game of cat-and-mouse. It is also an account of one “party system” eclipsing another. When Hoover invited president-elect Roosevelt to the White House to talk about British and French debt, Roosevelt rejected Hoover’s suggestions less because he disagreed with them than because he wanted a new era of more personal and direct diplomacy. And when Hoover implored him to praise the gold standard, promise to balance the budget, and eschew indebtedness, Hoover sought to forestall what he knew would be an explicit rejection of laissez-faire. Leaders in both parties stood mouth agape as the inherited coalitions, strategies, and assumptions of both parties broke, balked, or backfired. Liberal Republicans like Henry Wallace realized their party had too many men like Hoover for it ever to embrace the New Deal, and older Democrats like Al Smith worried about Roosevelt’s capacity for recklessness. Before it was over, millions wound up voting in ways they had never though imaginable. Winter War rejects the idea that FDR was an “ignorant but blithe spirit simply trying expedients” and not knowing where he was going. It insists that much of the New Deal, at least in contour, was shaped before Inauguration Day. It also challenges biographies of Hoover that have emphasized his Progressive streak, arguing that that had frayed beyond recognition by 1932. In doing so, the book offers striking parallels to our own predicament. For one thing, it reminds us that ideological warfare in American politics was hardly invented in the 1990s or 1960s. Not only is it much older, it has reached white-heat intensity before. By emphasizing Hoover’s right-wing obduracy — in some ways, he and not Roosevelt is the book’s central character — it also invites comparison between the politics of obstruction then and now. Finally (and hopefully for those disgruntled with the status quo), by casting Roosevelt as a wily parvenu striving to appear gracious while knowing that he only need run down the clock to get what he wants, it reminds us how much change the American system can produce when an old party system finally shuffles off its mortal coil. —Kip Wedel is an associate professor of History and Politics at Bethel College in North Newton, Kansas.